Obituary – Chastain, Johnny James « Perry High School Alumni Association, Inc.
– came to Perry from Yale for his senior year of high school and won places on both the Maroon football and basketball squads. He is 17 years old and was born in Greenfield. His parents are Mr. and Mrs. John R. Chastain. Grade education for Johnny included Maramec, Greenfield, and Quay schools. He attended Yale high school before coming here. He plans to enroll in Oklahoma A. and M. college, Stillwater, after he receives his PHS diploma. 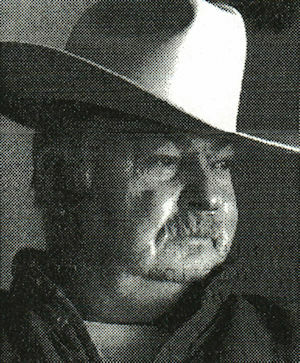 Funeral services for Johnny James Chastain, 79, of Chickasha, will be held Thursday, February 3, 2005, at 1:00 P.M., in the First Assembly of God Church, in Perry, Oklahoma, with Reverend Lonnie Rutherford and Reverend Irvin Rutherford officiating. Johnny James Chastain was born, November 23, 1925, in Greenfield, Oklahoma, the son of John R. Chastain, and Mary Stover Chastain. He died Monday, January 31, 2005, in Chickasha. Johnny grew up and attended schools in Yale, Oklahoma. He attended his senior year and graduated from Perry High School. After high school, he was inducted into the U.S. Army, serving during WWII. He served from January 5, 1944 to May 4, 1946. He earned many medals, ribbons, and honors for his accomplishments during his military career. Johnny attended college at Oklahoma A&M. He graduated from college in 1951, with a bachelor’s degree in Trade and Industrial Education. Johnny married the love of his life, Reba I. Rutherford, on November 26, 1951, in Perry, Oklahoma. They were married for 53 years. This union brought them their three sons: John R., Mark, and Kevin. He worked for Shell Oil Company for 38 years, and 8 months. He retired from Shell Oil on February 1,1989. After his retirement he enjoyed life to the fullest. He fished every chance he got and he continued to enjoy his photography photographing anything that would pose for him. He was a member of the First Baptist Church, in Perry. He was also a member of the Masonic Lodge of Perry, and the International Fellowship of Christians and Jews. He is preceded in death by both parents, one son, John R. Chastain, and one sister, Lawanda Chastain. Survivors include his wife Reba Chastain, of the home; two sons and daughters-in-law: Mark R. and Julie Chastain, of Mustang, Oklahoma, and Kevin and Sarah Chastain, of Dalton, Wisconsin; three grandsons: John, Michael, and Stephen Chastain, of Dalton, Wisconsin; two granddaughters: Jordan and Dakota Chastain, of Mustang, Oklahoma. Reba and family will be at the funeral home on Wednesday evening from 5:00 p.m. until 7:00 p.m., for viewing and visitation with friends and family. Interment will be in the Sample Cemetery near Lucien, Oklahoma, under the direction of Ferguson Funeral Home.